I once received sheet music from another pianist. 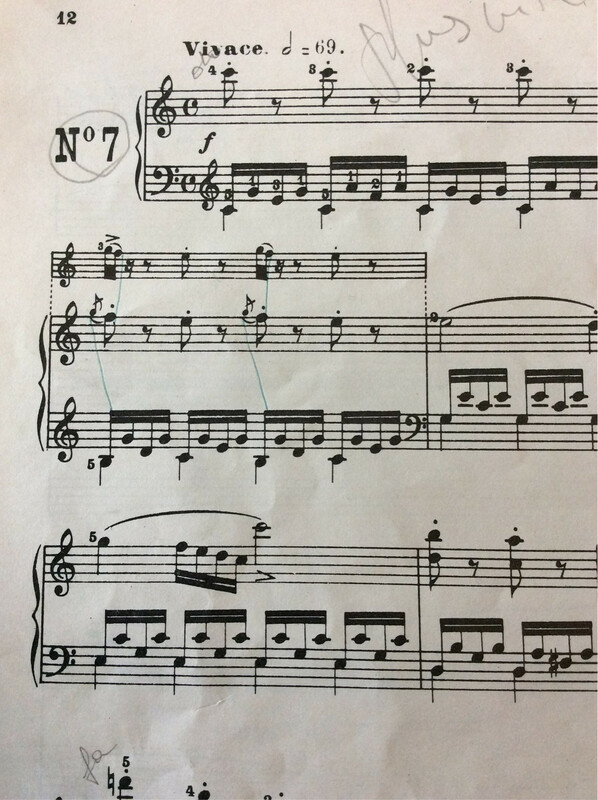 Years later, I started actually playing the piano, and I'm trying to figure out how to read sheet music. See that second line there? Right below the "N°7", there's a smaller G clef staff above the other two. It is an "ossia" staff. They can be used to show how to play a particular ornament like a trill. However, in this case it more likely shows an alternative execution: the main staff shows acciaccature (which are played before the beat) while the ossia staff shows an execution on the beat. So in the main staff, you'd play the "f" of the eighth note on the first beat while in the ossia staff you'd play the preceding "g". Either that, or the original composer uses uncommon notation and the publisher adds a note for the actual execution. An alternative version will more likely occur for every similar execution while an execution hint will likely only be used for the first occurence (possibly the first bar). But that's not really a hard and fast rule. With the given quoted amount, I'd not really be sure which interpretation to employ here. It's just a helpful version of the proper treble clef, showing how to play the ornaments. You're not intended to play them both. And in this case it isn't really an ossia - an alternative version. It's just conveying the editor's opinion of how the ornament should be played. He wants it on the beat, not before the beat. The connecting line that someone has pencilled in indicates the same thing. Not the answer you're looking for? Browse other questions tagged theory piano notation sheet-music terminology or ask your own question. Why is it common to write tuba sheet music in concert pitch? When you look at (piano) sheet music, how do you “think about” which notes are being referred to? How long can it take for a young adult to learn piano?